When we travel we try to seek out really unique places to stay that are going to make a destination really special. Sometimes it can be difficult to find those truly unusual places to stay: often they are small and independent and booked up months in advance. We have done the research for you and have 22 tried and tested recommendations of unique places to stay around the world from top travel bloggers. Best of all, they are all suitable for families. From treehouses to houseboats to yurts and teepees, these are the perfect places to plan a trip around. From Costa Rica to India to Sweden, we have you covered on every continent. Why stay in a traditional hotel when you can stay in an ice hotel, glamp at a tea plantation or stay in a haunted castle? 1.22.1 Enjoyed Reading this Post? SIGN UP for more. Planning a trip to dream destination, Sri Lanka, this Summer? Book into these fabulous treetop cabanas with unrivaled ocean views for a guaranteed unforgettable stay. Perched on stilts these cabanas are completely open sided offering the ultimate beach life experience. Breathe in adventure as you settle down for the night to the crash of the surf, the chirping of cicadas and a blaze of stars punctuating the night sky. What could be better than being awoken by the raucous dawn chorus, squirrels racing through the rafters & a perfect barrel curling on your doorstep? The ultimate getaway for adventurous families, surfers or those who want to get off the beaten track, a stay at Hilltop Cabanas at Lighthouse Point, was definitely a highlight of our month long stay in Sri Lanka. 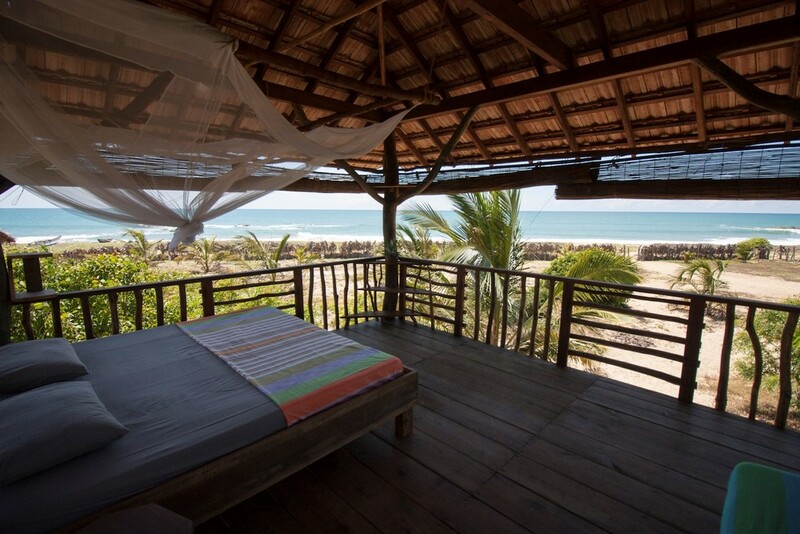 A 30 minute tuk tuk ride from popular East Coast surf spot, Arugam Bay, Hilltop Cabanas is pure paradise. Seven basic, simply beautiful, cabanas set into lush tropical gardens, with a pumping surf break and incredible ocean vistas. We also loved sustainable living at Hilltop Cabanas. Each cabana has one small light and a USB charger completely powered by solar and water is drawn from a well on-site. Hilltop Cabanas with it’s slow, simple living is heaven on earth. An hours drive from the capital city, Ulan Bator lies the GORKHI-TERELJ National Park. A landscape during Summer of wide flat green plains dotted with pure white traditional houses called Gers. Nomadic families set up their homes from the back of a truck to live and farm livestock over the Summer months. The Ger is constructed of layers to keep the warmth in and the elements out. Inside the Ger there are wooden beds surrounded by brightly decorated posts holding up the structure. A small oven warms the Ger and is used for cooking. We spent time living with a local in his Ger learning about day to day life. The kids were involved in all aspects of daily life including collecting cow manure to keep the fire going and water collected from the river for cooking. We all rode on horseback across rivers and grassland soaking in a vastly different landscape and culture to our own hometown. I dreamt of staying on a houseboat in Amsterdam ever since my first visit to the city when I spied people living on the canals who relaxed on their decks watching the world go by. It seemed like the perfect way to experience the city. When we returned to Amsterdam I found the perfect house boat for our family stay. Just 100 metres from the Anne Frank House on the Prinsengracht canal, the houseboat could not have been in a better position. We wandered the small canals and Jordaan district and woke to the sound of the Westerkerk bells tolling. But my favourite part about staying on the houseboat was spending our afternoons relaxing on our deck enjoying the passing boat traffic and the hustle and bustle of life in beautiful Amsterdam. Our visit to Hobbitenango, in the mountains above Antigua, was like being transported into a fairy tale. As I sat watching the rolling fog enshroud the hills around me, I felt completely disconnected from the world. The kids had a blast petting the goats, running wild in the trees, and playing with the giant dice and bean bag toss. There’s also a small playground for younger kids, and a rope swing for older ones. I loved that they could do all this while I enjoyed delicious food and a drink (or two) on the patio overlooking them, as well as the spectacular view. The larger cabin, Casita del Nido, is carved right into the mountainside. It has a round, hobbit-door leading the way into a cozy hobbit house. Falling asleep to the crackling of the fire, while looking out the window at the stars, was magical. And, being built with sustainable materials, and run completely off the grid, this eco-accommodation is both good for the environment and for the soul. All kids want to stay in a castle, am I right? St Briavels Castle was built in the 12th century and is one of Britain’s ‘most haunted’ buildings. It’s been a Royal castle, an armaments store and a debtors’ prison over its long history. Now it’s owned by English Heritage and operated by the YHA as a youth hostel. This makes it a really cost effective place for a family break at £69 for a family room for 4 people and £89 for a 6 bed private room. Those bargain prices are for the whole family per night! Accommodation is in simple bunk and single beds in historic rooms. Whilst there you can take a tour of the castle and find out more about its ghoulish history or learn archery in the castle’s gardens. On some nights a medieval banquet is held with delicious food and an entertaining host, followed by a mystery to solve with clues placed around the castle. For unique accommodation at an absolute bargain price with some spooky goings on thrown in, St Briavels is a great adventure into medieval history. Our unique place to stay around the world was staying for the first time in a tea plantation in Madulkelle in Sri Lanka. The place has amazing views, and our tent had all the luxury and comfort that you can imagine including a bathtub, different tea, wifi in the middle of nowhere, huge bed and couches. You can walk around the tea plantation, try their tea, swim in the pool and we spent most of our time taking pictures. The staff were really friendly and they made our stay our favorite one. The best part was that we got invited to this hotel because one of our Instagram followers invited us while we were traveling around Sri Lanka. Another long day’s driving is complete as we arrive at our accommodation for the night. But the really neat thing about travelling around Africa in a Land Rover Defender with roof tents is that we’ve brought the accommodation along with us. We’ve stayed in city centres, National Parks, remote bush camps and grassy riverside pitches, but each night we have the familiar, homely and comfortable roof tents to retire to. Ten minutes to put up and space for a parent and one child in each tent (we have two). After a hot chocolate around the campfire, regaling the adventures of that day and planning the coming days, we love nothing more than climbing the ladder, zipping the doors shut and falling asleep under the African stars. If you visit Kerala in southern India, you have to spend one night in a houseboat on the Backwaters! This huge river system stretches out on a big part of the state and the best way to explore it is by boat. You can rent a houseboat including captain and cook, and it’s best to visit the Backwaters for two days including one night on the boat. This will give you enough time to relax and to enjoy the peaceful and beautiful atmosphere, as well as the stunning sunsets on the water. Houseboats can be found in different price categories; there are low budget options as well as very luxurious boats – this is entirely up to you and your budget. No matter which boat you chose, it’s an incredible experience you shouldn’t miss! Click here to check houseboat prices in Kerala. We spent a little bit over a week in Casa Tres Monos, an awesome house in Costa Rica. It’s in the middle of the jungle of Punta Uva and it was amazing. Okay, there’s no hot water (there was, but it wasn’t working), the toilet was outside and there were bugs (do-oh, it’s a jungle!) but it was incredible. It was within walking distance to Punta Uva beach, which is just one of the best Caribbean beaches in Costa Rica and there was just so much wildlife! We saw a sloth on a tree on our way to the beach, encountered many monkeys taking the fruit we left for them, enjoyed a show of fireflies while having dinner, I was nearly kissed (or eaten) by a hummingbird, we spent hours looking at the gorgeous spiders working on their webs, and so much more! It was one of the most memorable places we have stayed! Jaisalmer Fort, built in 1156AD, is thought to be one of the only living forts in the world. As you approach Jaisalmer the fort rises up from the Thar Desert, glowing yellow in the rising and setting sun. Within the walls are dozens of temples, palaces and ornately decorated havelis waiting to be explored. Tucked down an alleyway is the Hotel Victoria. Located within the fort wall, it has spectacular views across the fort and out toward the desert. With thick stone walls, narrow stairways and traditional decoration, the hotel evokes a sense of history. Our room had a stone balcony jutting out from the fort wall. Piled with cushions, it was the perfect place to daydream about medieval battles in times past. Click here to check the best prices. Staying in an overwater villa in the Maldives is something that’s written down on many people’s bucket lists, including my own. Last year in November I finally got to do it at a resort island called Kuramathi. And yes, it’s just as amazing as you imagine beforehand. The overwater villas comes in various forms in the Maldives and accommodate both couples and families. Usually, you’ll have your private ladder down to the water and a terrace as well. Some overwater villas even have a private pool. In addition to being a fantastic accommodation and experience, the resorts also offer lots of activities such as snorkeling, diving with whale sharks and mantas, boat trips, private island trips, local island trips and various beach and water sports. Staying in a teepee in the Pacific Northwest at Clyde Holliday State Park near the popular and scenic John Day River in Oregon, USA is one of the most unique and affordable places we have stayed as a family who travels. Two canvas-walled teepees are available for reservation and include a picnic table, fire pit, and hot shower facilities. A nearby freshwater creek with stones perfect for skipping, horseshoe pit, and nature trails make staying here incredibly fun for families. The teepee is huge so there is plenty of space for up to 8 people. Teepee amenities include a space heater, vinyl covered sleeping pads for 8, an electrical outlet, and a wooden bench. Our family of four only used half the space available! Make a reservation online in advance for a mid-April through late September booking because these popular teepees fill up quickly during Oregon’s high season in summer. The cost for a teepee reservation is $46 per night. Trust me, adventure-loving families are going to love the experience of camping and staying in a teepee! One of the most unreal experiences I’ve had is camping by the sea, in the Qatari desert. I was living in the capital Doha at the time and it was strange to leave the bright lights of the big city far behind and escape to the desert – where the only sound was the gentle lapping of the waves of the ocean along sandy shores. The accommodation on hand was beachside huts, although not many of us slept at all. We swam in the ocean until night descending, stopping for a barbeque of many meats and salad. We then sat around the tables, listening to gentle music out of portable radio and trading stories, moving out to the sand dunes to star gaze several hours later. In the early hours of the morning we were back in the ocean, ready and waiting for the sun to slowly ascend above the horizon. This was one of my favourite experiences in Qatar, along with dune bashing – always go with an expert, so that you don’t end up bogged in the sand! Staying at Hidden Valley Yurts, deep within the South Wales countryside is a unique experience indeed. Nestled among ancient woodland, with wonderful views, are five Mongolian yurts. Each yurt has a brightly coloured door, all traditionally hand-painted, and its own private decked area with a BBQ and chiminea. At the heart of each yurt is a log burner which keeps the yurt cosy and warm at all times. The yurts sleep between five and seven people making them perfect for families. Not only is the natural setting beautiful but everything has been thought of to make this a premier glamping experience – no muddy toilet blocks here! Children and adults alike are in their element, building dens in the forest areas, playing hide and seek amongst the trees, meeting the farm animals and collecting eggs from the hens. The combination of the outstanding yurts, the beautiful Welsh countryside and the excellent facilities make this place a winner for families. After enjoying a few days and ticking off places in our Stockholm itinerary, we set off on a long train journey to Kiruna, a gem in North Sweden. Just 20 minutes away from Kiruna is Jukkasjärvi, a beautiful town by the River Torne. And located in Jukkasjärvi is the revolutionary Ice Hotel with a mind blowing concept where an entire hotel is made up of ICE!! The bed, the walls, the pillars, the doors, drinking glasses – everything is made up of ice. Guests are given warm sleeping bags that can stay cozy even in -40 degrees centigrade. The rooms at the Ice Hotel are kept at -5 degrees. Every winter, Torne River completely freezes and the folks at Ice Hotel mine ice blocks of 2-tons each and keep it in a huge storage which is maintained at -5 degrees. These ice blocks are saved to build the entire hotel anew each year. In summer, the entire hotel is allowed to melt and everything is built from scratch! Amazing isn’t it? One of the most interesting and unique places to stay is in a Japanese temple. There are many locations throughout Japan that now specialize in offering travelers a different perspective on the culture as well as a good night’s sleep. One city with an abundance of temples offering travelers accommodation is Koya-san. Koya-san is an ancient city in Wakayama Prefecture south of Osaka in Japan. The town has 117 temples. Of these, over 50 temples or “shukubo” allow guests. The rooms are all outfitted in traditional Japanese style with tamami mats, sliding doors and comfortable bedding on the floor. Most of the temples provide dinner and or breakfast. Here the offering is totally vegetarian with unusual – for a Westerner – ingredients artfully presented in a multitude of small dishes served by monks. All guests are respectfully expected to attend morning prayer services which begin at around 6:30 and last about 40 minutes. The service consists of melodic chanting, gongs and incense burning. After a while the sounds and smells become soothing and relaxing in the cool dark room. The highlight of staying in Koya-san is the nearby cemetery named Okunoin which is one of the oldest and largest in Japan with somewhere around half a million souls. Nobody knows for sure as the cemetery dates back over 1200 years. The statuary is stunning and the atmosphere peaceful, Night tours of the cemetery are offered by the local monks who also share information on the history and culture of the necropolis. Spending a night in such a unique environment was truly a special and memorable experience. Click here to check the best prices on temple stays in Koya-san. One of the most magical places to stay in Bali, Indonesia, is the AirBnB rental Hideout Lightroom. This bamboo house is tucked away in the countryside of Bali where you can experience the genuine side of the island with its friendly locals. Hideout Lightroom is an eco building totally made out of bamboo and is handmade by the locals and its owners. From the furniture and outdoor shower, to the entrance and outdoor terrace by the river – everything is made out of bamboo. It’s a unique place to stay, and it’s very relaxing too. It was amazing to stay in such a remote area of Bali, where the only thing you could hear is the sound of the river, singing birds, and wind that is blowing through the trees. From the breakfast moments while sipping on coffee and eating bananas next to the river to the relaxing outdoor flower baths and the quietness and sound of the wildlife at night – it was an experience I’ll never forget. If you ever go to Bali, I can highly recommend you to stay at this place a couple of days! The Elqui Domos refers to the seven geodesic domes located in Pisco Elqui. While they look a bit like tents from the outside, the domes are far from basic. Inside, you’ll find a two-story floor plan, up to four beds, and a private bathroom. When you stay at the Elqui Domos, you can lounge by the pool by day or pop open the stargazing hatch before bed to do some of best constellation spotting in South America. Click here to check the latest prices at Elqui Domos. One of the most special and unique places I have ever found to stay while travelling with the family is Sleeperzzz located in a small village called Rogart in Scotland. It is located between Inverness and John O’Groats in the Scottish Highlands. The thing that makes Sleeperzz so special is that the accommodation is in one of a number of train carriages that have been renovated as bedrooms. There are a few to choose from to cater for groups between 3 and 9 people. They are perfect for a family and something different that provide children with a real sense of adventure – our kids loved it. To top it off, the village of Rogart is a quiet and peaceful location surrounded by the Scottish highlands. If you are touring Scotland it really should be on your list. Igloos! The word conjures up dreams of the Inuit and sledding across vast expanses of snow. You normally have to travel to Iceland, Sweden or other Nordic countries to enjoy this luxury. But this year I found out about Tashi and Vikas who are making their seasonal igloo stays in India accessible to everyone. And their rates were less than a tenth of the cost in other countries. I liked that when we got to Sethan valley near Manali for the igloo camp stay we could see them in the distance from the top of the valley. As soon as we got to the bottom, everyone started posing for pics in the twilight. Of course, those pics weren’t as good as the pics we took the next morning after scrambling atop the igloo. The igloos were eco-friendly and had no amenities in them other than our sleeping bags and night lamp. But waking up in them was the best feeling ever! On a recent trip to Corsica, we wanted to experience the wild and naturally diverse landscape away from the more touristy coastal areas. We booked this traditional roulotte on Airbnb that was tucked away in a small rural village in Northern Corsica. It was such a fun and unique place to stay! The caravan itself had been fully renovated inside but had been done so in tune with its traditional style. It had a small but fully functional kitchen area, a lounge/dining/sleeping area, and a separate bathroom with a beautiful clawfoot bath. A couch pulled out into a double bed, and another day bed turned into two singles – so there was plenty of room for our family of three. We’d eat most meals outside where we’d watch wild cattle wandering by and hear the stream running gently behind us. I’d really recommend it for anyone wanting to experience the true Corsica – and kids will love the novelty factor of sleeping in this old wooden caravan! One of the highlights of our Outback road trip was visiting the opal mining town of Coober Pedy. It was really interesting to learn more about the town’s history and how its residents survive in one of the driest and hottest places in Australia. But the highlight was definitely staying in an underground hotel. Due to the extreme heat, local residents build their houses underground in what is termed “dugouts”. We wanted to experience what it was like to sleep underground and it was definitely one of the most unusual places we have stayed. The hotel had all modern conveniences, but the rock walls definitely made us feel like we were underground. Amazingly, no air conditioning is needed and the room was a wonderful escape from the 40 degree temperatures. Click here to see the best hotels in Coober Pedy. Have you stayed in a really unique place? We would love to hear about it in the comments below. I know there are so many great places to add to my bucket list here!